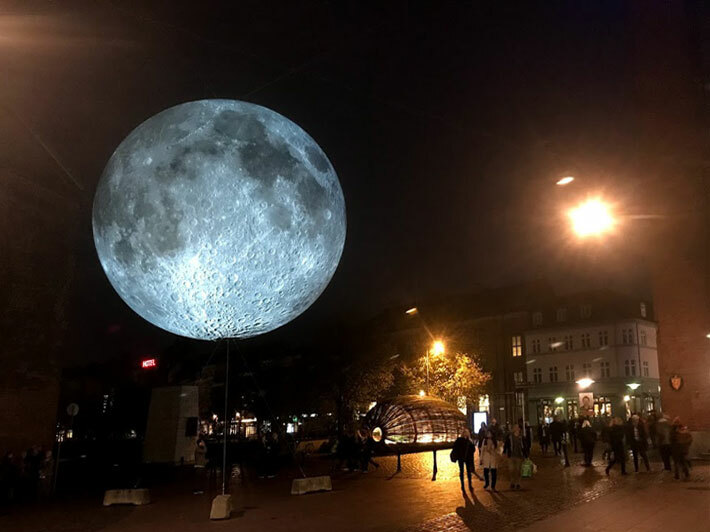 The Museum of the Moon was exhibited in Aarhus, Denmark for the European Capital of Culture 2017. 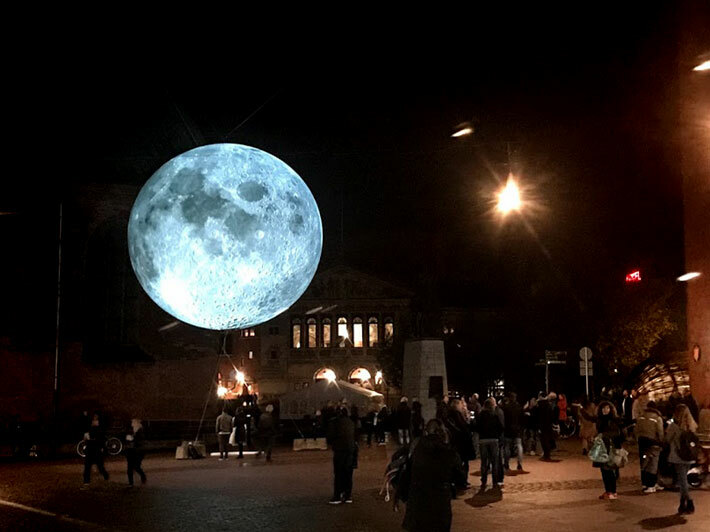 Presented as part of Move for Life which is a large programme of events inspiring people to get up and get active under the full moon, they aim to activate as many citizens in the region as possible. 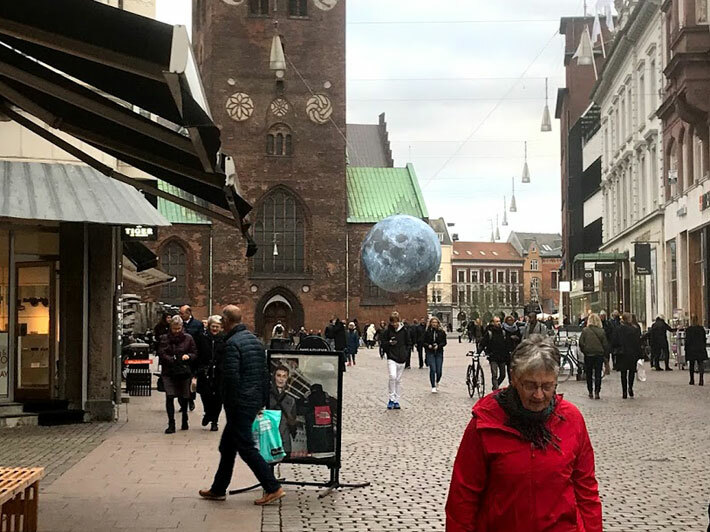 The artwork was presented on the 4th and 5th November, outside Aarhus Cathedral. Aarhus has been appointed European Capital of Culture in 2017. The title European Capital of Culture (ECOC) represents one of the most prestigious and prominent cultural events in Europe. Every year two EU countries are appointed as host countries. In 2017 Paphos, Cyprus has also been nominated as ECOC. Copenhagen was the first Danish city to host the ECOC in 1996, and it will be many years before a Danish city can boast the title again. Capital of Culture Aarhus 2017 is supported by Central Denmark Region and all the municipalities in the region. It is deeply rooted in strong regional cooperation across the entire region. With the theme of Sport & Play, Aarhus 2017 are challenging to go the extra mile: “In Denmark, we move the body in many ways. We walk upstairs, cycle, we run, we jump on sculptures and have fun. Sport is not just for the elite athlete but for everyone, and we are rethinking any number of ways to keep people fit, active, motivated and participating. Månesyge – Moon sickness (see “Lunacy” – Insanity, Lazy “Luna” Moon) An old term for certain mental disorders that was thought to be induced when the moon’s rays hit a sleeping person. In the past the full moon was considered to be an etiological factor in the elaboration of epilepsy , sleepiness and hysteria. In addition, the phases of the moon were set in connection with the woman’s menstrual cycle, which has a similar duration. This meant expanding ideas that the moon affected fertility and the unborn child.